Pick-up trucks are traditionally used by small business owners who did not need a heavy transporter and whose area of business usually lay in close proximity. Now if these machines were used by small business owners, price was to be kept at a minimum, the engine had to be powerful yet efficient and the durability of the product needed to be unquestionable. This is where the consumer segment was established for a crude yet powerful, usually a two-seater, automobile with a flat-bed at the rear. A little down the line the buying power of people increased in certain countries, now people had the finance to buy two cars instead of one and if they already owned a regular car, the Pick-Up trucks offered to be a good alternative. With regular consumers buying it the crude yet powerful and efficient vehicle got that leeway to experiment with the designing, adding features to it, making it more personal for the everyday man. This is a time when SUVs were a trend yet to really get going, so if you wanted to travel over the weekend or go camping or go to the beach, the Pick-Up trucks were a great option to drive around in. This second phase of consumers made the Pick-Up truck a lifestyle product rather than a livelihood product that it originally was. Livelihood Consumers: Now in our country firstly the small business usually take years to give them enough finances to buy a vehicle for commercial purposes and even if they buy a commercial vehicle it would be a Tata Ace or a Piaggio Ape, which can carry load three times over, is relatively easier to maintain, drastically cheaper and since its has been around for a long time has a certain amount of sense of security attached to it. Lifestyle Consumers: This is a category in our country which is still evolving. We are a country where there are 41 cars per thousand people and lets not get into how many of them own two or more cars. So realistically speaking, a Pick-Up truck will not be your first buy maybe your second, but the people who can afford to buy a second car should have the need for it. As usually is the case with a segment this narrow, it is shouldered by enthusiasts, people who understand the machine, know what the machine is to be used for and then use it accordingly. So as on date maybe we as a nation have not reached the point yet where we understand a Pick-up truck and use it or need a Pick-Up truck enough to buy it. Not commenting on the commercial usage of the Pick-Up’s (PUPs) if we focus on the lifestyle aspect only, we realise that it would be unfair to blame only the consumer at this failure of a segment. As the marketing mantra goes, The Consumers don’t Know What they want Unless you give it to them , the manufacturer in India have also not really pushed as hard as they could have when it came to the PUPs, we have had very limited options available when it came to buying PUPs, a point we focus upon in the following paragraph. 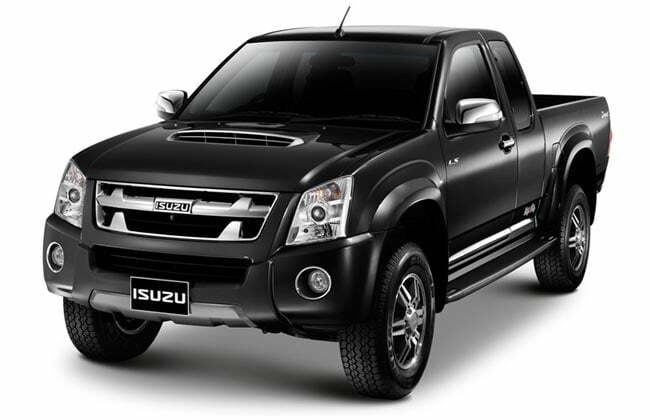 Isuzu, the Japanese utility vehicle manufacturer launched the D-Max in two variants on 29th May 2014 in Delhi. This is a company who has been tremendously successful when it comes to commercial vehicles, Utility Vehicles and are leaders in manufacturing diesel engines; What made these veterans enter a potential rich market for SUV’s and instead concentrate on Pick-Up trucks? Statistically there is an expected increase in demand for PUP’s (Pick-Up’s) by the year 2023, as India is a developing economy on the verge of becoming a superpower, and the backbone of this growth would be the small business, so Isuzu plans to use their expertise in this segment and fortify their stronghold in our markets before this demand boom sets in. Not only are they targeting the customers coming their way because their livelihood depends on it, but also the ones who shall benefit directly themselves from a growing economy and with an increase in finances would like to have a secondary vehicle for off-roading or similar purposes. Its a prudent move from an old war-horse which knows its way into a growing market. 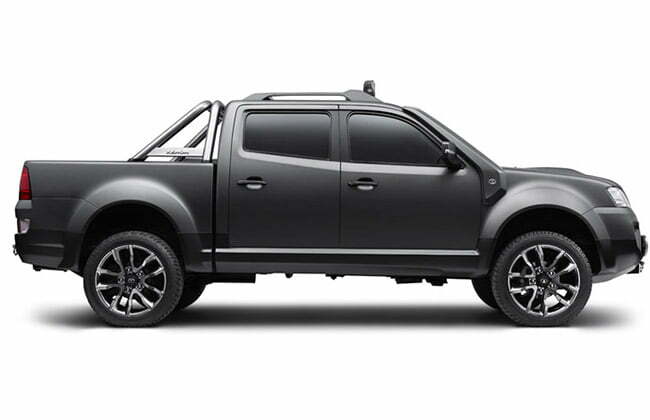 Check out as to what are the options that we have when it comes to Pick-up trucks as on date. Its quite honestly a Scorpio with the third row cut-off and an extended bed added int its place, there is very little change in the design otherwise. Powered by a 2.6 L turbocharged Common Rail Diesel Engine that unleashes 115 BHP @ 3800 rpm and 277.5 Nm @ 1700 rpm. The two-wheel drive is enhanced with a 5-speed manual transmission and covers 0 to 100 KMPH in 19.7 seconds. Mileage: 9 KMPL City and 11 KMPL Highway. This is from our point of view is the best product aesthetically and also packs in a host of features. The Xenon XT is equipped with a 2.2 litre VTT DICOR (Variable Turbine Technology – Direct Injection Common Rail) diesel engine that churns out an awesome power of 139 BHP. The engine is mated to a 5-speed manual transmission and an intelligent ECU (engine control unit) and It gives a maximum speed of 160 KMPH. Mileage: 9 KMPL City and 12 KMPL Highway. Price: Rs 10.5 Lakhs (Delhi) for the 4×4. Out of the three, its the most simple looking and not made as a lifestyle vehicle. 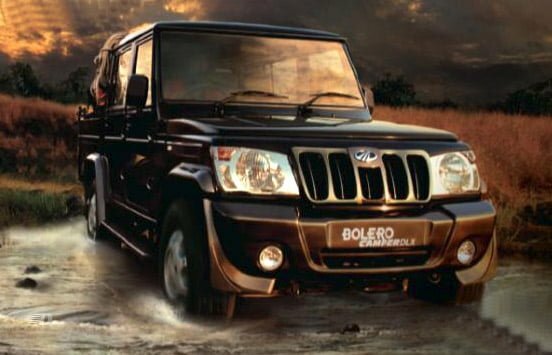 The Bolero Camper is propelled by a 2.5L turbocharged direct injection diesel churning out 72 BHP of power and a peak torque of 176 Nm. The standard transmission on Camper Gold is a 5-speed manual and that on the Camper DI and Huber is a 4-speed manual. Coming from a manufacturer with global real-time experience with PUP’s it feels to be a bit of a let down to see it to be only a two seater, the interiors have a no-nonsense feel to it and the extra space behind the seats can be useful in longer trips. Mileage: upward of 16 KMPL on Highway. Price: Rs 8.5 to 9 Lakhs (Delhi) for the Arched Deck. The above mentioned are only those PUPs which can be used as personal vehicles, the commercial Pick-Ups are not being discussed. 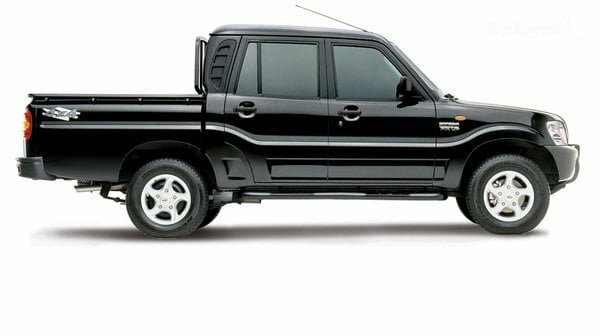 So what the previous segment proves is that the kind of Pick-Up trucks which are available to us are either at a price at which you can get a high end Compact SUV or do not have the finishing which is expected out of it, though they may be affordable. Tata Safari and -a little later- the Mahindra Scorpio made owning SUV’s trendy. They broke the barriers and the SUV started being considered as a personal vehicle, the point here being that the manufacturer focused on developing the market for it and delivering a high end luxurious product on the inside while retaining its power streak on the outside. Comfort: Comfort in terms of rideablity and maneuverability in the city, using better materials and technology is hands down the first step to be taken. The driver does not want to feel like sitting behind the wheels of a lorry while he drives to office everyday. Durability: The consumer would want a robust machine which delivers when totally packed and can withstand the elements it encounters on its journey be it off-road or in the city. Designing: The first thing and usually the deciding factor for millions is the first look of the car, the engine and specs follow but good eye catching creative designing on the exterior and interior can be a major selling point. Features: This is uncharted territory in our Pick-Up Trucks atleast, just because it is a PUP it does not mean it cannot have the latest technology and features in the cockpit and the console, this is a rich playing field for manufacturers to experiment with. Engine Performance: Getting away from the mileage aspect, the engine should deliver irrespective of the terrain, weather, load. A pick-up truck’s engine cannot slack, that said Co2 emissions need to be mitigated as well. Hybrid engines will also make it “The” vehicle to own, and if we are talking about a car of the future then why shouldn’t it be a hybrid ? For Pick-Up trucks to really break its current image of a commercial vehicle and become a status symbol in our country the onus lies on the manufacturer. This is the vehicle which provided the platform for the SUV’s to come to life and somehow it has been overtaken by it. We are not saying that the SUV and a PUP have the same uses, but before GM made it out for the public, the Hummer was used only by the Military. The point being if we have a competitve market with enough products to choose from it would not be tough to Indian customers excited about Pick-Up trucks too, but it wont happen unless more bigwigs like Isuzu want it to happen. Tell us how you feel about Pick-Up’s in India through the comment section below.